Pictured are some of the promotional giveaways the Phillies will be handing out at home games during the 2018 season. Baseball is back! Well, almost. The Phillies' begin Spring Training games this week, open the regular season in Atlanta at the end of March, and have their first home game at Citizens Bank Park on April 5. While the team's promising young prospects and offseason additions figure to make a more competitive club in 2018, the Phightins aren't expected to be playoff contenders by most experts. Hopefully, the team's "bold" new approach under freshman manager Gabe Kapler means defying expectations this season. But even if that's not the case, one of the secondary perks about attending baseball games is free stuff, and a lot of it. Baseball games are set up for promotional giveaways more than games in other sports for a number of reasons. Most importantly, there are simply more games in an MLB season than the other three major sports leagues. But baseball teams also tend to attract more casual fans than other sports, meaning there's more of a need to incentivize passive supporters to attend. Giveaways help make that happen. But when you're looking at the Phillies schedule throughout the season and deciding which promotional night to attend, you don't want to go for just any giveaway. Which is where I, Phillies fan and connoisseur of snagging freebies, come in to help. Below, I'll rank the best – and worst — giveaways for the 2018 Phillies season. An important note: The Phillies don't release images of all the giveaways this early in the season. So, some of the giveaways have been judged without rating how they look. Additionally, most giveaways are restricted to fans of a certain age or gender, or both. Are these circumstances unfair? Maybe. But life isn't fair, and there's no crying in baseball. Deal with it. It's always interesting to me when teams try and hand out electronics. Last year, the Phillies gave away an entire kit of goodies that included earbud headphones and a USB phone charger plug. I'll admit I still have the charger plug, an item for which it doesn't really matter if its a cheap product. But the earbuds stopped working not long after getting them and had to be tossed. With headphones, you always want to pony up a little more for at least slightly higher quality, something the Phillies obviously won't do for a giveaway to thousands of fans. I doubt these headphones will be any different. That being said, these might be worth getting if you sit next to a Mets fan at work, since the bright red and white will be in their peripheral all day. Free hats are always the best type of giveaway. Unlike shirts, which are usually distributed only in an XL size, giveaway hats are almost always adjustable, meaning fans of all shapes and sizes can enjoy them without feeling weird wearing them. That's why it's so disappointing the only giveaway baseball cap-style hat for fans older than 14 years old looks like this. First off, who wants a trucker hat? Second, it incorporates white, dark grey and a shade of blue the Phillies don't even use. The only way you can even tell it's a Phillies hat is because it says Phillies on the front. Color scheme is important, people. Will I attend this promotional night? Yes. Will I wear the hat? Yes. Will I enjoy it? No. Kids always get the best promotional items — as they should, they're kids. 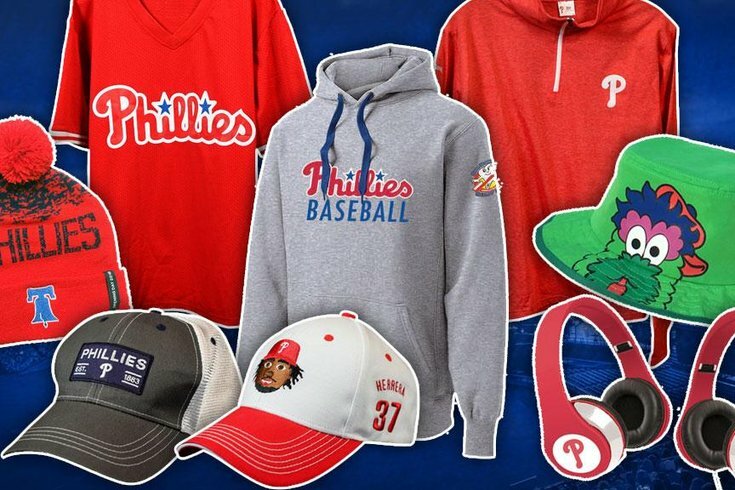 The water bottle makes the "Worst" list because it pales in comparison to the other children's giveaways on the Phillies schedule; a Phanatic bucket hat, a hoodie and a collectible toy truck are among the cool freebies I didn't include in the "Best" category. A water bottle is a practical giveaway, and one I, as someone in his mid-twenties, would actually appreciate. Which is exactly why it's dumb for kids. They come to Phillies games to eat cotton candy, drink soda, wear silly hats, goof off with the Phanatic and watch Rhys Hoskins hit dingers, not to be reminded to stay hydrated. As previously stated, hats are the best giveaways. Knit hats are even better. Knit hats with decent designs are the best. For Opening Day, the Phillies will be handing out these beauties to everyone. They feature the Liberty Bell logo seen on the Spring Training caps this year, and the top of the hat looks — *thinks of eloquent description* — freaking sweet, dude. Get your Opening Day tickets now. Again, kids get the best giveaways. 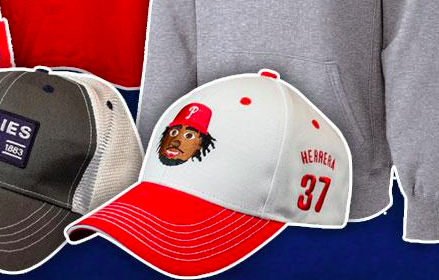 Not only does this hat feature the Phillies' most fun player, it's also sponsored by a brand synonymous with Philadelphia. Assuming the TastyKake logo is somewhere on the cap, I'd much rather have that than "X random company willing to pay for a sponsorship." Additionally, the front of the hat is the face of a baseball player who is also wearing a hat. Wild, man. I'm lumping these two together because they're essentially the same promotion for the same reason — one for Mother's Day and one for Father's Day. Yes, clothing giveaways can sometimes be disappointing because they usually come in one size, but a pullover is a bit different, mainly because it's less weird if it fits a little loose. The team doesn't have images of either giveaway, but I imagine the pullover featured in the top right of the photo below is one of them. Like free stuff? Of course you do. Over 1.5K people retweeted for a free pad of sticky notes from us last month. Most importantly, both games are a great way to give basically a bonus gift to mom or dad for their respective holidays. You already got them tickets to a Phillies game, and now they get some free gear on top of that. Buy them a beer/soda/beverage of their choosing and you're all set! There's also a "mystery" bobblehead on the promotional schedule, as well as a Hoskins figurine for kids. But a Lidge bobblehead is one you can place on your dresser knowing he won't get traded or sign with another team since he's retired. He also played a huge role in delivering the Phillies their first championship in 28 years. Appropriately, the team is also honoring the 10th anniversary of the 2008 World Series team before this game, so make sure to go early if you go to get one of these bobbleheads.